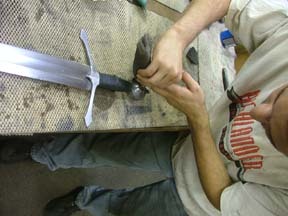 Your Albion sword has been painstakingly crafted by hand and eye to provide you and your heirs with a lasting heirloom. We use only the finest carbon tool steels, mild steels, and irons in our creations. These materials are all chosen for their similarity to original materials utilized to create works in centuries past. They are not stainless or stain-resistant, and if neglected or poorly treated will rust and decay. However, with the same basic and simple care required to properly maintain a fine firearm, your Albion sword will last for generations. After handling, cutting, or after six months of storage or display, the metal components should be wiped clean with a soft cloth, and lightly oiled with a quality machine or gun oil. We strongly recommend Break-Free CLP as the premium oil for this use - it is the same oil that we use prior to shipping the finished pieces from our shop. 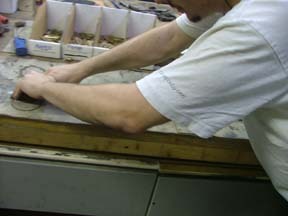 A more traditional approach would be to use a quality mineral oil, although it would require more frequent application. You can also choose to apply a fine paste wax from tip to pommel. We recommend a product like TreWax which provides a clear, non-yellowing finish. 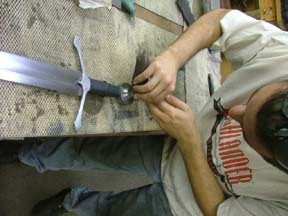 Apply the wax to the entire sword using a soft brush, let it dry, then buff by hand with a clean soft cloth. A wax finish will keep your sword rust free for several months (in most climates) and is easy to reapply after handling. 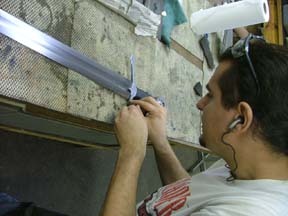 Minor surface scratches on the hilt components and blade can be removed using a fine (grey) ScotchBrite pad with oil. It is important to note before beginning, which direction the "grain" of the finish has already -- going against this "grain" will cause unsightly cross-scratches that will mar the finish and will be very difficult to remove by hand. 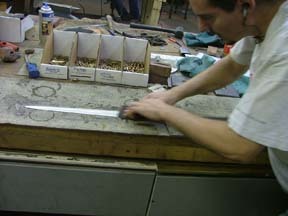 Jason restoring the finish to a guard, using a Fine (Grey) ScotchBrite Pad and oil in a side to side motion. Scent-stopper pommels are usually are finished up and down, wheel pommels without a riser from side to side , and wheel pommels with risers are finished in a circular manner. Jason restoring the finish to a wheel pommel with riser, using a Fine (Grey) ScotchBrite Pad and oil in a circular motion. 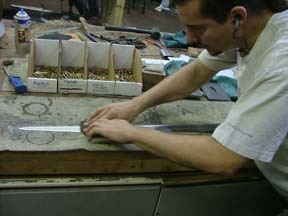 Blades are always finished from base to tip. When restoring the finish with a ScotchBrite pad and oil, always start at the base of the blade and run the pad gently and straight toward the tip in as even and continuous motion as possible. Even with this periodic care, the metal components still tend to age over time, and you will note certain changes in color and hue. Under proper care this is not corrosion or decay, but rather an attractive patina that is much desired and common to well-maintained ancient metalwork. Think of it as the piece recording its own history, as only a traditionally made piece can. Leatherwork should be maintained by periodic buffing with a clean soft cloth. You may wish to also wax the grip using a product like TreWax (available from Albion). If You Cannot Fix It -- Don't Despair! We are always here to help. 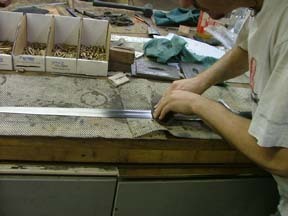 For a small fee, Albion can fully refurbish your sword and make it almost like new again. Contact Albion Customer Service for a price quote and turnaround time. 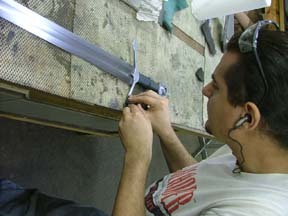 In addition, Albion offers several Maintenance Plans where we will do the work for you, keeping your sword, or your entire Albion collection, in perfect condition. Great care was taken in the making and assembly of your Albion sword. However, even with the pains taken to seal and stabilize all of the organic materials used, extremes in temperature and humidity can sometimes create small expansions and shrinkage that lead to potential loosening of the hilt. Although rare, should this occur we offer refurbishment and repair by our shop at no cost to you apart from return shipping. 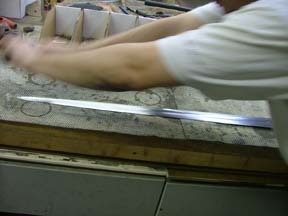 All Albion Mark swords are guaranteed for life against defects in materials and workmanship.